Why do you say you left fundamentalism? Christian Fundamentalism includes, but is not limited to, the following ideologies: Christian legalism, Quiverfull, young earth creationism, anti-LGBT rights, Christian Patriarchy, modesty and purity culture, betrothal and/or courtship, stay-at-home daughter movement, Dominionism, and Christian Reconstructionism. It is not limited to Protestantism and can also be seen in Catholic, Mormon, and other subcultures. Does it mean I stopped believing core doctrines of the faith? No. Have I wrestled with what to believe now? Yes. I actually wrote a post on it called help my unbelief. But many of the fundamentalist ideologies listed above are recent inventions, reacting against the hippie movement and supporting the conservative boom of the Reagan administration. These are not central tenets of the faith, at least traditionally. My Catholic and Orthodox friends have showed me as much. The trouble is that we mean different things when we use terms like fundamentalism. Or legalism. My sister told me her freshman seminar at Bob Jones University discussed how to avoid legalism. But from my perspective, the BJU student handbook is legalistic (check out the dress codes) and doesn’t allow college students to formulate opinions. Why did I leave fundamentalism? Because those belief systems taught me to fear the outside, helped me to think that only people who believed the exact same set of things I did were safe to associate with. I realized purity culture can make women feel like their virginity determines their worth, and I stopped wearing my purity ring. I replaced it with different rings, rings that matched a new understanding of my worth. I stopped believing in courtship because I realized my dad may never approve who I would want to marry. I sold my copy of the Botkins sisters’ book So Much More during freshman year of college, because well. The Botkins said girls were more easily tainted by the college experience and should not seek out higher education. Rebecca Davis wrote about why being a stay-at-home daughter is not a Biblical mandate in her post For Shame, Beautiful Botkins. She defends single female missionaries the Botkins condemned. I read about how many were hurt by Bill Gothard’s teachings and abuse at Recovering Grace. One of my chemistry professors reminded me that I didn’t have to believe in young earth creationism because “it’s not a salvation issue.” Now my answer is simply: I don’t know. I don’t care whether the universe came about in 6 days or 6 billion years. It’s a beautiful place to live, and I like to think someone awesome created it somehow. Oddly, the Pearls’ articles against patriarchy in 2011 convinced me that my family was unhealthy: Cloistered Homeschool Syndrome and Patriarchal Dysfunctional Families, Part 2. Although their child rearing methods advocate breaking childrens’ spirits and enable abuse. In my teen years, I knew several Quiverfull families, although my family only had us three. I loved hanging out with the family with 13 kids we knew in Dallas, and the Jeub kids made me feel almost one of them at their birthday bash in 2013. But I always wondered if they were really happy or if they hid their problems. I read books like The Children Are Free arguing that Christianity and LGBT lifestyles aren’t incompatible. And my friend Cynthia Jeub wrote a defense of equal marriage rights, based on her own interpretation of the Bible. I now support making all marital unions contract-based, with a divorce clause built in so breakups could be more amicable. Then religious organizations wouldn’t be forced to perform ceremonies, and my LGBT friends would have equality with any other couple. My parents didn’t believe all of the fundamental philosophies I’ve described here. Many of them I found in Focus on the Family’s Clubhouse or Brio magazines and devotional / Christian living books I received for Christmas or birthdays. For those who believe Christian theology, valuing anything to the point of worship would be idolatry. I believe that I give over my darkness and am healed by the light, and for me, I think it comes from Jesus. But videos and sermons like Ludy’s seem to encourage excessive self-denial and an obsession with sacrifice. This is the problem with words like fundamentalism. For one person, the words capture a beautiful release or fulfillment. For another, the same words trigger being crushed by guilt and self-hatred. In leaving fundamentalism, I left behind a cult-like system of beliefs that caged me. This is why I only attend church services and events sporadically. Many familiar things are still painful. Rachel Held Evans described this in her post this week Post-Evangelicals and Why We Can’t Just Get Over It. This is why it’s taken me over two years to hope I can find welcome in a church again. This is what I left. I just really love hearing from you. Your heart is so open. This makes so much sense to me. I grew up in the Assemblies of God church. I am still rediscovering why I believe what I believe instead of just believing what I was told all those years. Hi. A friend pointed me to your blog and I’ve spent the last week using my spare moments (admittedly few) to read your #WhyILeftFundamentalism series as well as most of the older posts you linked to in them. This post made me smile because almost as soon as I started reading I realized that I had a conception of what fundamentalism looked like but not an actual working definition of it, so I got lost in an internet rabbit hole trying to figure it out. If only I had waited a week. ^_^ Anyway, I just want to let you know that reading this has been really powerful for me; it speaks to some of my experiences in a way I’ve never put words to, and I appreciate that. Thank you. You should read “The Language of God”….I have been having quite the debate with my family with regards to the Young Earth idea and evolution (like you I’m still not sure about the details)…but even mentioning that Genesis (parts of it) may not be entirely literal, I get called blasphemous. So yes, Eleanor, we have much to catch up on. Eleanor, again you are very good at writing . In a nut shell God breaks it down to this….LOVE GOD and LOVE PEOPLE. This is Christianity. Religion complicates things. In your searching I would encourage you to read the new testament. Just read it…I love listening to the bible on-line audio. Get to know Jesus and let the rest fall away. Again. I like your insights and honesty. I just finished your blog stories about your childhood and leaving your parents house. Thanks for your transparency. As a homeschooling, Jesus follower, 40 year old father of 5, it pains me to see the damage being done in the name of Christ. I’m finding that a good antidote to the ugliness of American Christian fundamentalism are many of the ideas and concepts within the modern Anabaptist movement. I’m now following you on Twitter (@hanschoelo) and if you have any questions I can help with on your journey to discover Jesus as he really is, feel free to reach out. Hi, Eleanor! I like reading many of your blog entries. I really appreciate how you take the time to think through things and work to help others, too. Many times, what you write resonates with my church experience, since I got involved in the Evangelical church scene. Been trying to find my way back to more moderate faith in Christ. Among the challenges for me has been recognizing that the fundamentalism infiltrated my faith relatively early on in my walk, even though I was a United Methodist / Presbyterian (USA) / Protestant-Catholic ecumenist at the time. My family lives in an area where congregations with active children’s ministries tend to be funamentalist-leaning. It is frustrating for me, because we have one child in the family. Our daughter would love to have friends and play with kids her age, but my triggers will get so bad during a service, that I’ll want to bolt for the door, once the pastor opens his mouth. Other more moderate churches are a better fit for me, but don’t provide the peer social interaction I desire for my daughter. I’m working on sorting things out theologically, but I realize full well how tough it can be. I’ve definitely been taught that being Christ’s slave means that God is to take over my body and make me a zombie — in essence, that I am to cease to exist as an individual Christ-follower and become a part of God. I’ve also been taught that taking up my cross and dying to myself means that I am to be a doormat to abusers, including abusive men and controlling / abusive church leaders — and that I am not allowed to speak up or defend myself, since I am a woman and a non-leader. Because of these things, I have ended up abused in the Church, and I’m constantly having to reassure myself that I can think for myself, have my own identity and own life, stand up for myself, have actual boundaries (beyond purity-related), and still be a follower of Christ. Because of abuse I have received from men and Evangelical / complementarian male church leaders in particular, I have re-examined the Scriptures and am currently predominantly an egalitarian, viewing male headship to play a very limited role that does not actually preclude women from teaching and leading. I needed to do this, in order to restore my dignity and begin speaking up for myself, since I couldn’t do that before in my Evangelical / “non-denominational” churches. Another problem for me, has been the use of charismata in these same churches — used in an abusive manner, to keep people controlled by leadership, and preventing laity / church members from following the example of discernment / critical thinking / reasoning of the Bereans (Acts 17:11). 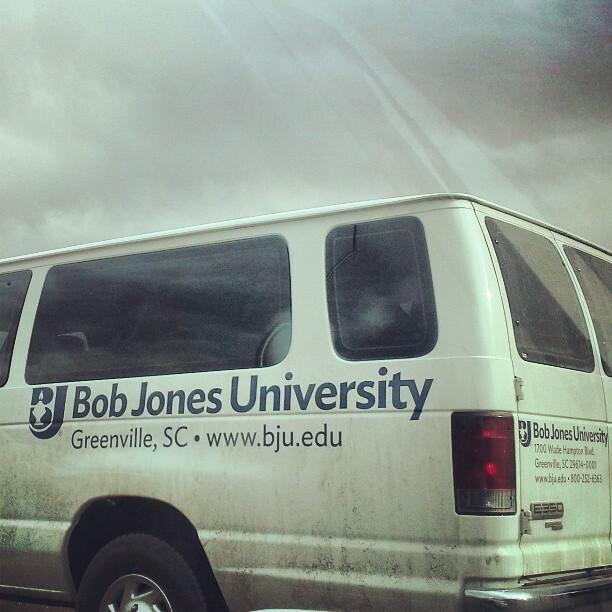 I agree with you that the BJU student expectations are out of control. Reading them, I was left with the impression that they were the framework for abuses waiting to happen — if nothing else, then simply unbiblical levels of control being exerted over the students in particular. Jesus referred to this as “lording it over”, and specifically forbade that among His followers. Anyway, I don’t know where I’m headed on my journey. It’s a challenging path to be on, some days. But, it’s worth it to me to learn to honor Christ with my mind and make my faith my own, so I’m trying. 1. Unless I’m mistaken, there is an occasional passage in Scripture, pointing to time being relative: a thousand years equaling a day, and / or vice versa. So, I look at time like a rubber band, or a ball of silly putty: possibly somewhat relative, even from a biblical perspective. This would fit with the scientific concept of interstellar time, which I believe is connected to Einstein’s observations on the relativity of time. 2. I recall reading in the book of Joshua, that there was a day when the sun stood still, or didn’t set. That day would not be a 24-hour period equal to the day before or after it. 3. I believe that the concept of a “day” in the first creation account was actually about a period of darkness (perhaps disorder?) preceding a period of light (perhaps order?). How do we know that those periods were twelve-hour periods? We don’t, and the Bible doesn’t say (that I am aware of, anyway). So, I take these “days” to be closer to maybe hundreds of millions of years. If it’s still one period of darkness followed by one period of light, it would seem to me that this would still fit a literal interpretation, anyway, AND be consistent with other passages, noting the relativity of time. If these “days” were much closer to our concept of hundreds of millions of years — or a billion years, or different intervals of time — this might be an indication that perhaps the Big Bang theory is not necessarily in disagreement with the Scriptures.